The Bermuda Economic Development Corporation [BEDC] has launched a new competition called ‘Vend2Win’, offering five local vendors the chance to showcase their products in New York, with the winners to receive a round-trip ticket to New York, accommodation and the chance to display their goods at The Reserve market. 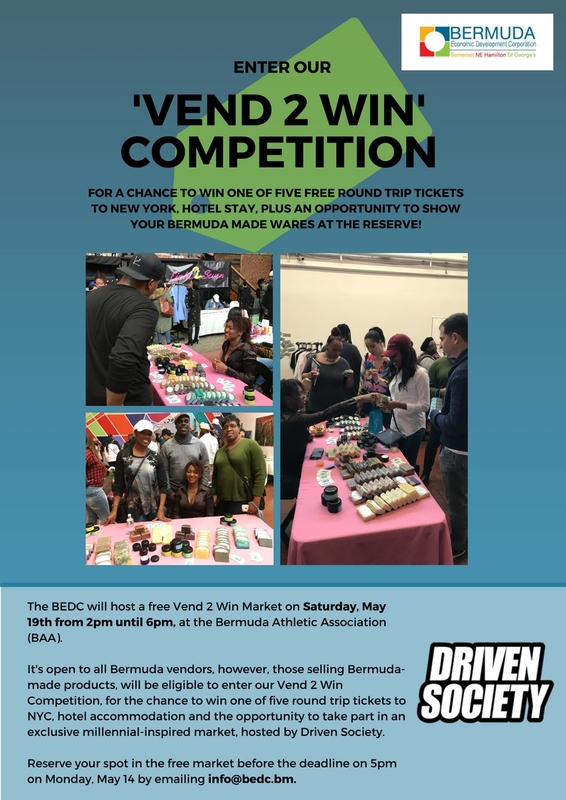 Entrepreneurs looking to enter the competition must sign up for the BEDC’s free upcoming ‘Vend 2 Win’ Vendor’s Market, being held at the Bermuda Athletics Association [BAA] Hall on Saturday, May 19 from 2pm until 6pm. Just in time for those looking for unique items for Bermuda Day, the market is open to all Bermuda vendors ready to sell their wares, however, only those offering Bermuda made products and who apply will be eligible for the ‘Vend 2 Win’ Competition. A secret panel of judges will be perusing the market and assessing vendors on their booth’s presentation, customer service, packaging and the overall buying experience to select the competition winners. Five lucky vendors will receive an all-expenses paid round-trip ticket to New York, hotel accommodation as well as the chance to display their goods at The Reserve, a large multi-sensory shopping and networking experience, organized by the Driven Society, taking place in June 2018. Ondreyah Rochester, BEDC Trainee Economic Development Officer and Bermuda’s lead coordinator for the June event, said: “BEDC is pleased to be able to provide micro enterprises on the Island this fantastic opportunity to raise the bar and participate on an international level in the Big Apple. Earlier this year, local business owner Felica DeRoza, of Butterfli [a brand of Bermudian produced soaps, body creams and lotions] was given the opportunity to take part in a smaller version of the market, set in an eclectic co-working space in Brooklyn Commons on Saturday, March 10th 2018. BEDC arranged for Ms DeRoza to sell her collection at the event, which she described as an “amazing experience”. She also said her brand was “welcomed into the Brooklyn community with grace and excitement”. Erica Smith, the Executive Director of the BEDC, said she was pleased to provide five local entrepreneurs with the chance to experience a vendor market overseas and gain an awareness of what it takes to grow and scale their businesses internationally. “We were thrilled to see how much knowledge Felica soaked up at the New York event in March and have since worked to make this opportunity possible for other Bermuda micro business owners. To sign up for the free vendors’ market on Saturday, May 19, email info@bedc.bm or orochester@bedc.bm . You will be sent an application form, which allows you to confirm your spot in the market. Those Bermuda-made or inspired vendors will automatically be entered into the Vend 2 Win Competition. To learn more about the upcoming June event offered by the Driven Society, visit www.drivensociety.com.